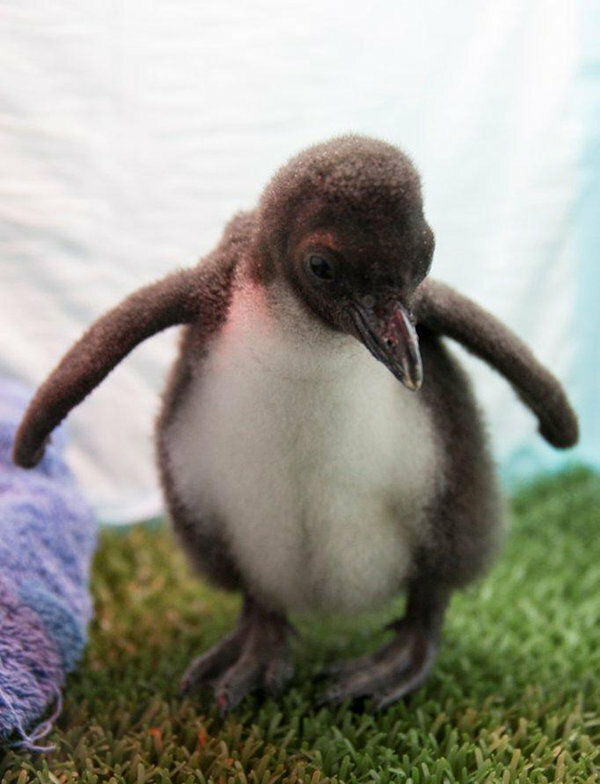 Loro Parque extends its penguin colony with four newborn southern rock hopper penguins, which are in good health and are evolving good in the penguin baby station. These young marine birds were born in December and remained for a certain time in the incubator. They are being fed a particular diet based on fish porridge with calcium supplement, in proportion to 10% of their weight. 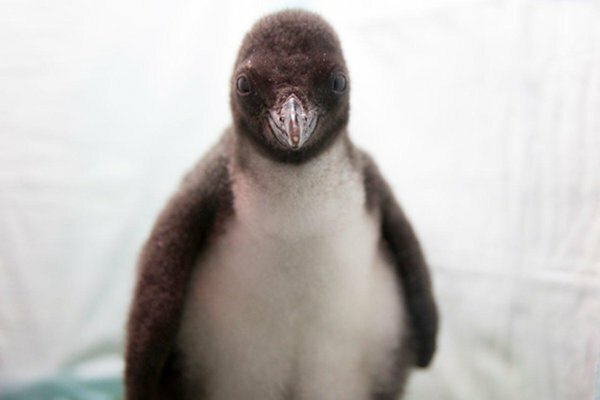 For about two months, they will be reared in the penguin baby station, where the chicks receive the necessary care during the first stage of their lives. After this period, the integration process will begin to take place, in which they will be adapting to their new environment until they finally obtain the complete integration with the rest of the penguins of the Loro Parque. At this stage, the gender of the chicks is unknown until we process the first blood analysis. The experts of Loro Parque in Planet Penguin take care for the birds with a lot of knowledge, love and respect, and so Loro Parque has magnificent results, since the breeding of all marine bird species (Humboldt Penguin, King Penguin, Gentoo Penguin, Chinstrap Penguin, Rock hopper Penguin and Atlantic Puffin) has been achieved. The inhabitants of one of the best penguin exhibits in the world enjoy an installation with all the guarantees that produces 12 tons of snow daily, has filters against a microbial contamination of the air and recreates the conditions of light and temperature ideal for an optimal reproduction. Thanks to the plentiful food supply which becomes available every year in springtime in the Antarctica’s polar ecosystem, penguins form colonies of hundreds of thousands of specimens. Unfortunately, this abundant diet is being seriously threatened by overfishing and by climate change, which adversely affects marine currents. For example, the continuous snowfall and the glaciers, where King Penguins use to nest, are also at great risk of disappearing due to global warming of the planet caused by the greenhouse effect. All these circumstances seriously threaten the future of these amazing birds and Loro Parque in its role of a modern zoo operates to raise awareness about these issues among the public and support the conservations efforts. At the same time, Loro Parque has implemented environmental management system and is developing its own photovoltaic solar energy plant and promoting sustainable and responsible use of resources while protecting the natural habitats of the animals in the wild. The discovery of a new roosting site for Blue-throated Macaw Ara glaucogularis coupled with an innovative and successful programme geared towards promoting the use of artificial feathers in ceremonial headdresses, gives renewed hope for the survival of this charismatic parrot. The Blue-throated Macaw is one of South America’s rarest parrots, with a population estimated at around 250 individuals. In the last decade, Asociación Armonía (BirdLife Partner in Bolivia) has been tackling the main threats affecting it: habitat loss, the lack of breeding sites and ending illegal poaching. 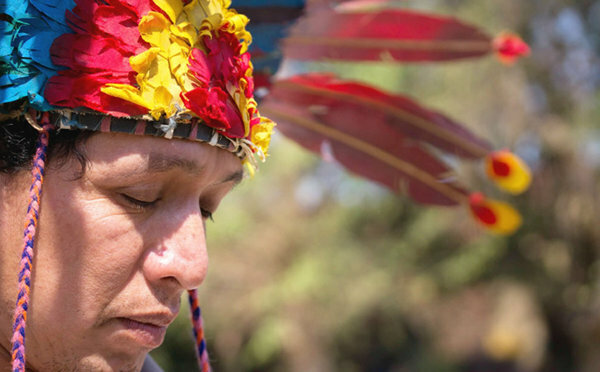 But their approach to ending the latter has been especially unique and very successful: to give locals an alternative to using real macaw feathers for their headdresses. During their traditional celebrations, the inhabitants of the Moxeño plains in Bolivia’s Beni department perform with colourful headdresses as they move to the rhythm of bongos and flutes. The dancers, so-called macheteros, dedicate their movements and attire to the colours of nature. Unfortunately, those headdresses are made of macaw tail feathers from four different species, including the Blue-throated Macaw. This is where Armonía’s Alternative Feather Programme comes in; it consists of an educational campaign promoting the use of artificial feathers made of organic materials among the macheteros through workshops held in local schools. Those workshops could only be made possible thanks to the financial support of National Geographic’s Conservation Trust and the Loro Parque Foundation. Since the Moxeños consider themselves to be the guardians of nature and all of its creatures, they were quick to understand the importance of using substitutes. “Each headdress is made of an average of 30 central tail feathers; that means that one headdress of artificial feathers saves at least 15 macaws,” explained Gustavo Sánchez Avila, Armonía’s Conservation Programme coordinator for the Blue-throated Macaw in Trinidad. The programme, which started in 2010 with the support of Loro Parque Foundation, not only protects this critically endangered Macaw, but also empowers local craftsmen and women to preserve their natural heritage and their culture. Furthermore, after seeing the mesmerising dances, many tourists buy the alternative headdresses as souvenirs, providing locals with much needed additional income. Since 2010, the Moxeño people and Armonía have saved over 6000 individuals of four macaw species and engaged thousands of local people in the conservation of Bolivian nature. Most big Moxeño towns already host alternative feather training workshops, but rural areas still use real feathers. If you wish to help, you can support Armonía so that they can organise additional training workshops this year and save even more macaws. While conserving the already established populations of the Blue-throated Macaw is essential to their survival, further research remains vital to make sure none of its habitat is left unprotected. However, entering the Bolivian northern Department of Beni during the rainy season is a huge adventure. As seasonal rainfall merges with melt water from the Andes, the grasslands become extensively flooded, making it impossible for cars to travel around the area for three to five months every year. The situation forces locals to revert to their old ways, using horses to get across a savannah that is speckled with pools of water, knee-deep mud and head-high grasses. As a result, conservation research becomes complicated and expensive. But this was not going to stop our team of conservationists at Asociación Armonía, supported by the Cornell Lab of Ornithology and the Loro Parque Foundation, when they set off last summer to search for more roosting grounds of the macaw in this remote region. The truth is that the team had had many rough failed trips in the region to verify sites where owners swore they had seen the parrot, only to find they got the wrong bird. So, when they got a call from a local ranch owner who claimed to have seen the Blue-throated Macaw in his fields, the team reacted with some disbelief. 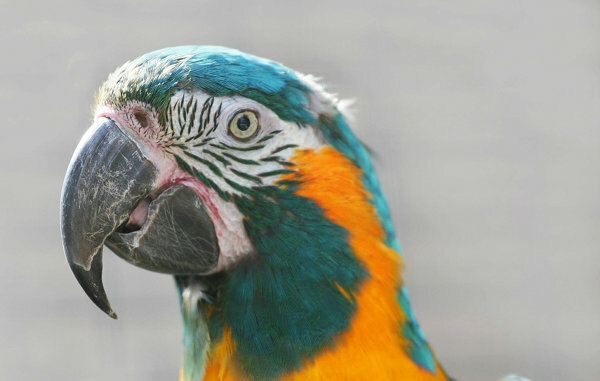 They had seen this happen a few times already: while many ranch owners proudly believe that they have seen the Blue-throated Macaw, to the untrained eye it is often confused with a more generalist species, the Blue-and-yellow Macaw Ara ararauna. Surprisingly, when they arrived on site, it turned out that at least 15 Blue-throated Macaws had made a small forest island their home. This new roosting site was confirmed only forty kilometres north of the Barba Azul Nature Reserve: the largest concentration of macaws in the world live here, with yearly counts of over 100 individuals. At one of Beni’s most important events of the year, the Chope Piesta, the macheteros are getting ready to start their traditional dance. Today, headdresses with alternative feathers outnumber natural ones nearly five to one. In the meantime, conservationists rejoice about the new discovery of a roosting site. Developments worth dancing about. In other words, J-34 was struck violently on the head, and continued to live for up to a few days, before succumbing to his injuries and dying, most likely alone, in the waters of the Pacific Northwest. 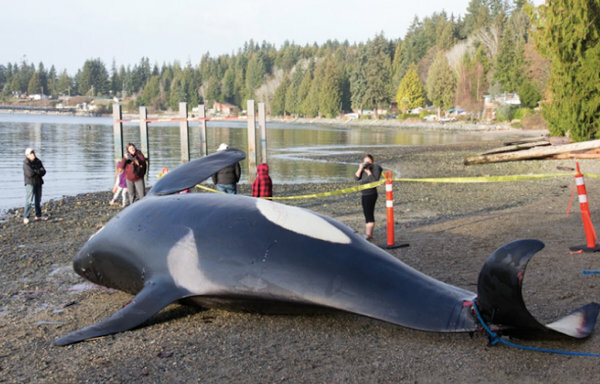 In another part of the country, 3 weeks after J-34’s body washed ashore, another well known male killer whale died. 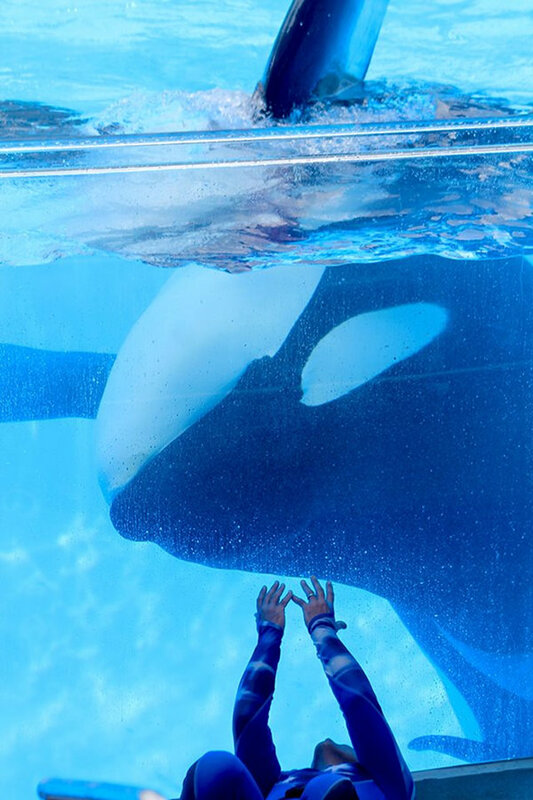 At age 36, after years of veterinary and behavioral support for a complicated chronic infection, SeaWorld Orlando’s Tilikum passed away quietly, in the early hours of January 6th, 2017. 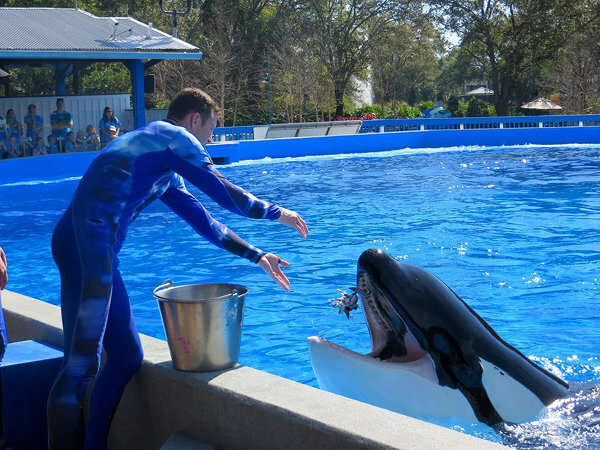 He was in the company of the trainers and killer whales he’d known for much of his life since his move to SeaWorld in 1992. Tilikum was well past the average life expectancy (30) listed by the NOAA for a male killer whale. He had been ill, and supported medically, for years, with an infection found in both free-ranging and zoological animals. His death was not violent or shocking, yet it garnered exponentially more news coverage and discussion then the fate of J-34. Why? Where were the so-called “animal rights” crusaders, so abundant on Twitter and Facebook, when J-34 was suffering? 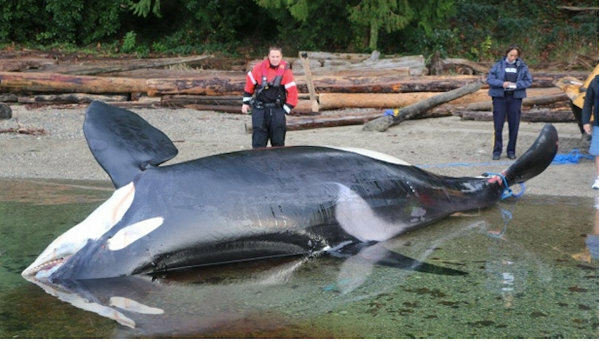 Why is the death of a geriatric, professionally cared for animal a national ignition point, but the slow and steady destruction of a group of wild whales a special interest story? By all logic it should be reversed: J-34 was the 4th death (out of 6 adults and 3 neonate calves) for the embattled Southern Residents this year. His passing was violent, likely caused by human interference and marked the removal of another breeding animal from a population where the survival rate to 1 year for a calf is less than 50%. But animal rights activism, from PETA to The DoDo and beyond, is big business, and it’s a lot easier to sell ethics if you have a shiny corporation like SeaWorld to demonize. While leveraging Tilikum’s death might do a lot for Ingrid Newkirk’s bottom line, addressing the death of J-34 means confronting a complicated and uncomfortable fact: humanity is failing the Southern Resident Killer whales. Their numbers are dropping. They’re listed as an endangered species. Over 50% of pregnancies are miscarried, and 43% of calves are lost in the first 6 months of life. They are some of the most contaminated animals on the planet, with nauseating levels of toxins building up in their blubber supply. Their supply of Chinook salmon, their primary food source, is being rapidly depleted. The negative impact of vessels, including whale watching boats, is becoming more and more apparent. All of these factors have been confirmed again and again by federal and NGOs seeking to help the whales recover. And yet, with the overwhelming information that the Southern Residents are crying out for help, it is Tilikum who makes the headline, SeaWorld who catches the outrage and moral grandstanding, all while Justin Trudeau’s federal Canadian government approves a tar sand pipline project through the primary habitat of the Southern Residents that may turn out to be the death warrant for one of the most well known and well studied killer whale populations on the planet. There is no time left for British Columbia’s whales. They are dying, and every time the public is told that attacking SeaWorld is how to help orcas, their chances of recovery grow even slimmer. On December 31st, 2016, “Granny,” the J-pod matriarch, was announced missing, and presumed dead, the most recent in 2016’s alarming Southern Resident fatalities. Even that wasn’t enough to draw the spotlight toward the silently vanishing whales. There is no true “wild.” Everywhere is marred by humanity’s impact. We must make a decision as a society to turn the tables for the wild whales. We must decide what dies with J-34: either a romanticized and outdated vision of the ocean, or the Southern Resident whales themselves. Last week, we discussed advancements in animal training with Dr. Grey Stafford. In this interview, I asked Dr. Stafford about SeaWorld’s decision to end the Orca breeding program. Watch the video below to learn what the current President of IMATA, Dr. Grey Stafford, thought about all this and what he encourages the animal care community to do in order to better the lives of future animals in the face of such destructive legislation and SeaWorld’s inability to correct public misconception. Kyle: Hi my name is Kyle Kittleson and welcome back to our conversation with Dr. Grey Stafford. Thank you for being here. You’ve been in the animal welfare space for 27 years and no question that the biggest announcement of 2016 was SeaWorld’s decision to have the last generation of killer whales. What are your thoughts about that? Stafford: Not the worldwide species, but the animals that live at a facility. And a lot of reasons that is done is because maybe there are enough animals to to maintain the population going forward. And and it’s it’s a question of resources. Where do you devote your time, your energy, your space, and your staffing, to preserve as many species as possible. And that’s a difficult choice. I think in this case with Orcas, the choice was made for all the wrong reasons – primarily politics and pressure from activist groups. Because the fact the matter is Orcas and human care are thriving today. We learn so much more about what’s happening, not only with the ones living in human care, but the ones in the wild. 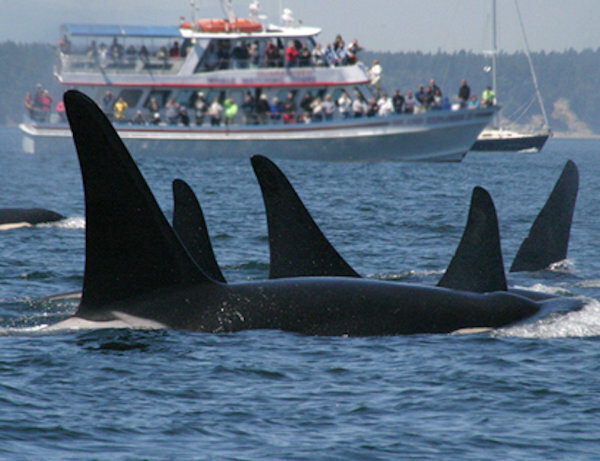 You know Orcas in British Columbia and elsewhere are in huge trouble. And I just saw a study done at SeaWorld, right now, where they’re actually trying to correlate drone data, photographic data, using captive killer whales SeaWorld to correlate those measurements, so they can then use that same process out in the wild to measure the body composition and condition of wild orcas to see if they’re starving or not which we know that they probably are right now. Kyle: And guess who’s not doing this type of research that can save the wild populations of killer whales? Almost every other organization out there. All of the “activist” organizations. I put “activists” in quotes because they are working in their best interest, rather than the animal’s best interests. In my opinion. What, if anything, did you do in 2016 to try and get this, you know, decision to stop or to keep from happening? Stafford: Well, prior to SeaWorld’s decision, which was a corporate business decision, a friend of ours, Carolyn Hennesy, actor, animal advocate, author – she and I went to her Congressman, Congressman Schiff, Democrat based in Burbank California. And Congressman Schiff has proposed a national ban on Orcas in human care – similar to the Bloom bill which did finally pass in California. And Carolyn and I went there last Thanksgiving weekend and pleaded with him and tried to understand how he arrived at this decision. 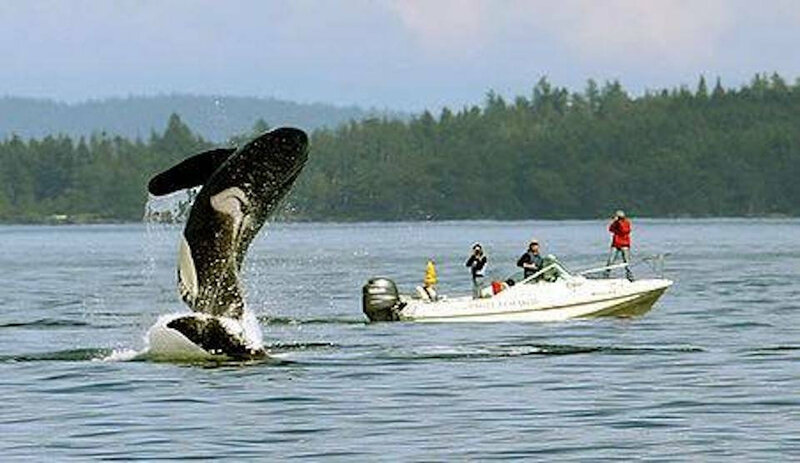 Why he would put so much effort behind this bill which sets a very dangerous precedent for all species, not just Orcas. We have agencies, we have federal laws that deal with the display, the transfer, etc of exotic endangered species. It’s called the Endangered Species Act, it’s called the Marine Mammal Protection Act and so forth. There is a process, a federal process, that goes through, and there’s a lot of oversight done with it. So, for Congressman Schiff to insert a bill that singles out a particular species to me is a very dangerous precedent. And we were talking with them trying to understand why he had arrived at decision and to try to get him to back away from it. Unfortunately our efforts were in vain because the very next morning he set up his office set up an e-mail blast of fellow members of Congress inviting him to join him on his shift bill which still sits in Congress. Unfortunately, our efforts were in vain because the very next morning he set up his office set up an e-mail blast of fellow members of Congress inviting him to join him on his Schiff bill which still sits in Congress. I suspect that given the recent election, that bill is not going to go anywhere, but is still out there and it is troubling that a that Congress would take up this issue for one species when we have those mechanisms already in place and well establish for 50 years. Kyle: No surprise though, that a politician would make a decision based on his own or her own best interests – rather than the best interest of the people or the animals. But what is surprising to me is that, and I can’t speak for Schiff, but I can’t imagine that this decision did not come without the influence from the movie Blackfish, which has been proven to be inaccurate, not factual. And so in some ways that’s like me making a decision about heart surgery because I watched an episode of Grey’s Anatomy. It doesn’t mean that I am educated in, you know, surgical procedures it just means I watched a movie. Stafford: Well and that’s why those of us who work with these species, you know, we have a job ahead of us to promote that education – whether it’s someone in a political office, or regulators, are critics, or detractor,s and especially our support of public. You know, the good news is that far more people support zoos and aquariums and support places like SeaWorld, because of the great work that they do. And we have to push back on some of the misinformation and that’s a that’s a tall order but you know what else what other choice do you have? Stafford: Couldn’t say it any better. And unfortunately, with today’s instantaneous media and 24-hour news cycles, we have to do a better job of promoting the positive things, the successful things, that zoos and aquariums are doing. We can’t rest on our laurels. We can’t, you know, be satisfied with the status quo. And you have to also remember there are entire industries dedicated to shutting zoos and aquariums down. There’s big business in complaining. There’s big business in activism. PETA’s coffers went up 30 percent over the last few years precisely because of their attacks on places like SeaWorld. So, while they’re out there making their money putting others down and trying to put them out of business, we’re busy trying to save species and protecting ourselves and promoting the great work that organizations do. That’s not our focus, that’s not our business plan, but it is something that we have to do a better job of making it a part of the business. And I think unfortunately we have to go that way. Kyle: You said this and I don’t want to go unnoticed. It’s big business for activism. Yes it is. Remember that. I want people to understand that the name people for the Ethical Treatment of Animals is a great name. It’s a great want that I want that. But when you look at the business of activism rather than the outcome of being an activist you may make different decisions and I don’t encourage anybody to take my word for it. I don’t you encourage you or take your word more at all. I encourage people to go out there and do their own research independently as possible and make their own conclusions but be educated with your decision. What do you think this means for SeaWorld to not have killer whales in the next 20 or 30 years. Kyle: Remember that. I want people to understand that the name People for the Ethical Treatment of Animals is a great name. I want that. I want that. But when you look at the business of activism rather than the outcome of being an activist you may make different decisions and I don’t encourage anybody to take my word for it. I don’t encourage you to take your word for it. I encourage people to go out there and do their own research independently as possible and make their own conclusions but be educated with your decision. What do you think this means for SeaWorld to not have killer whales in the next 20 or 30 years? Stafford: Well, SeaWorld is a business and SeaWorld will sink or swim based on its decisions. I worry more for the species and the great people that work there. Those people who get up at 3 a.m. to rescue a sea lion underneath someone’s car in La Jolla. Those stories need to be told. You know, we’re still under a UME, which is an “unusual mortality event” a designation by the federal government, for Sea Lions along the California coastline. Sea lions are starving to death and many of them are not even showing up on our shores anymore because they’re too emaciated even to leave the rookeries where they’re born. And this past year I think NOAA counted the fewest number of new births ever in the last 40 years of studying these rookery islands in the last 40 or 50 years. The lowest number of birth rates. And the reason for that is something is going on in our environment and it’s places like SeaWorld that help us understand what’s going on and hopefully mitigate whatever impact is happening to our oceans because eventually it’s all going to affect the rest of us, right? Kyle: Absolutely. And I only know of SeaWorld and the Marine Mammal Care Center in California that actively go out and rescue, rehab, and release those animals. Stafford: No other zoo or aquarium has rescued anywhere near the number of animals that SeaWorld has in its 50 years. Kyle: That’s right. If you compare those numbers to other organizations and how much they have rescued, rehabbed, and released, there be no question who I would want to support. And by the way, because I know someone will comment on this. SeaWorld pays me this (NOTHING) much money. OK, I do not get paid by SeaWorld. Stafford: I don’t either. I haven’t worked for SeaWorld and 21 years. Kyle: I barely got paid when I worked there. I have no vested interest in SeaWorld success. I only have an interest in animals having amazing lives. But those are the animals that live in the ocean. And those are the animals that live under the care of man. So, as long as those animals are happy, I’m happy. Kyle: Dr. Stafford, thank you so much. In our final video series which will be coming out next week, we’re going to be talking about what IMATA members can do and what the organization of IMATA can do to really help spread the true message of accredited zoos and aquariums and all the amazing things that they do for animals all over the world. So be on the lookout for that.